When Clackamas' Jake Zehr saw his sharp grounder disappear into South Salem shortstop Ryan Brown's glove, he figured Tuesday's playoff game was heading to the ninth inning. Brown then bobbled the ball as we went to pull it from his glove, and Zehr knew what that meant: Game over. Ryan Ahlstrom raced home from third on the error to lift Clackamas to a 3-2 victory over South Salem in Tuesday's OSAA Class 6A semifinal as the defending state-champion Cavalier advanced to the championship final for the fifth time in 11 seasons. 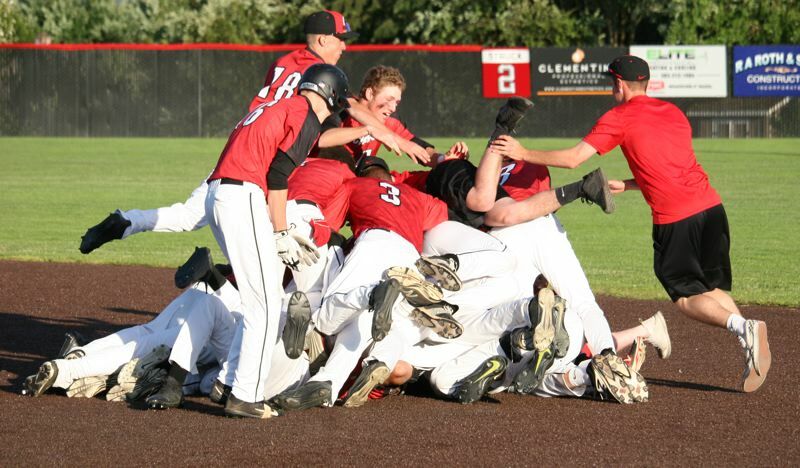 "We had to do it the hard way, but our kids dug and scratched and clawed and found a way to do it, and that's what it's about when you get this deep into the playoffs," Clackamas coach John Arntson said. The No. 3 Cavaliers (24-6) will face top-ranked Westview (27-3) at 5 p.m. Saturday at Volcanoes Stadium in Keizer with a chance to become the first Oregon team to win consecutive big-school titles since the Madison Senators did it 1969-70. "Now, we're one game away from doing it, so I know they're going to be excited to play and I know Westview is a heckuva program, so we're going to have our hands full. But at least we get a shot to go see what we can do." Ahlstrom led off the eighth inning with a bloop single to shallow left field off South Salem reliever Gavin Fredinburg, and then went to second on Ryan McDonald's sacrifice bunt back to the pitcher. After Grant Schoen drew an intentional walk, Alex Claxton flew out to center, but hit the ball deep enough to allow Ahlstrom to tag up and advance to third. The Saxons then walked Greg Mehlhaff intentionally, loading the bases with two outs for Zehr, the senior catcher who had popped out to shortstop, lined out to left field, flew out to center field, and hit a single to left field in his previous four at-bats. Zehr went after the pitch from Fredinburg and grounded it hard up the middle, forcing Brown to his left to make a play. "I was just hoping it went through," Zehr said. "At first, I thought the shortstop had it clean we were going to another extra inning. But once I saw it out of his glove, I knew we'd won. "This is what we've been working for all year -- one more game to go." Clackamas never trailed in the game, taking a 1-0 lead in the second inning with Brown, the junior right-hander, starting on the mound for the Saxons. The Cavaliers used a walk and two singles to load the bases before Claxton drew a two-out walk that force Nate Vaughn home with the game's first run. The Cavaliers added a run in the third when Tucker Grote hit a two-out single, advanced to second on a passed ball, and scored on Vaughn's single to the right side. Mehlhaff, the Clackamas starter, carried a two-hit shutout into the fifth inning when South Salem's Elijah Enomoto-Haole scored on Sean Alvardo's two-out single to make it 2-1. In the sixth, the Saxons tied the game when Greyson Hanowell drove a 2-2 pitch from Mehlhaff over the right-field fence for a solo homer. Hanowell's at-bat started with pinch-runner Zach Case at first base for South Salem, but Mehlhaff picked off the Saxons' freshman before his first pitch to Hanowell for the second out of the inning. Jeffrey Nelson relieved Mehlhaff to start the seventh and pitched two scoreless innings. With South Salem runners at first and second with one out in the seventh, Nelson picked off Brown at first base for the second out and then struck out Danny Alvarado to end in the inning. In the eighth, Nelson hit Hanowell with a pitch to put the Saxons' designated hitter on base with one out, and then he got Enomoto-Haole to ground into an inning-ending 6-4-3 double play. The Cavaliers then came up and scratched out a run to earn a return trip to Volcanoes Stadium. "I thought Brown made a heckuva play," Arntson said of the game's final play. "Jake squared it up and Brown got a glove on it, and I think he just couldn't get it out of his glove. "I feel horrible for it to end like that and for a kid feeling like he cost his team the game when he certainly didn't. He pitched his guts out to start the game and played a heckuva game. At the same time, Jake hit a ball really hard and made something happen, so you have to tip your cap to him as well."